Written by: admin on August 22, 2014. TECHO (which is the Spanish word for ‘roof’) is a global organization currently operating in 19 countries in Latin America and the Caribbean. The organization envisions a fair and poverty-free society, and its mission is to overcome poverty in slums through training and joint action of families and youth volunteers. Within each community, the role of advocacy for social policies is a central theme. TECHO’s intervention model is comprised of a three-phase approach. The initial phase is a needs assessment through Community Organizing Committees, the second phase is the implementation of programs in response to those needs (such as housing, education, and employment programs), and the third phase is the promotion of the implementation of lasting and sustainable solutions (such as regularization of property, access to basic services, housing, infrastructure and local development). TECHO was founded in Chile in 1997 by a group of university students who, along with Felipe Berríos del Solar S.J., were appalled by the country’s slum conditions. In particular, they felt provoked to take an active role in denouncing cases of extreme poverty. Through discussions with people living in slums, the idea arose to begin building modular houses to alleviate the precarious situation of thousands of people living in poverty. With the support of university volunteers and professionals dedicating themselves to the cause, the organization began to take shape. In just 17 years, TECHO has become one of the most well-known NGOs in Latin American and the Caribbean. TECHO currently implements housing and community development programs depending on identified community needs in Argentina, Bolivia, Brasil, Chile, Colombia, Costa Rica, Dominican Republic, Ecuador, El Salvador, Guatemala, Haiti, Honduras, Mexico, Nicaragua, Panama, Paraguay, Peru, Uruguay and Venezuela. In 2014, TECHO built its 100,000th transitional home and continues to expand throughout the region. 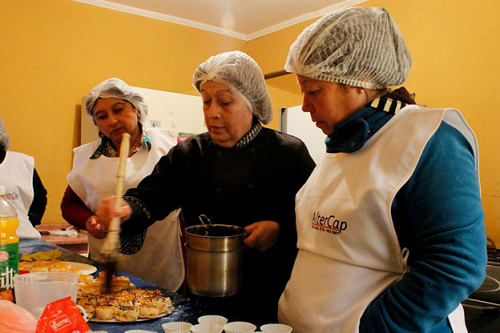 In Chile, for example, TECHO’s entrepreneurship and employability program Programa de Talleres de Aprendizaje Popular provides skills that people can use to improve their ability to find better job opportunities and make more money to support their families. Once the participants of these programs have learned from a skilled teacher, they can start their own small business or get a job in their new trade. This allows for an opportunity of maximized individual growth as well as a platform for participants to get to know each other and discuss problems within the community. – The organization has mobilized over 25,758 youth volunteers to work side by side with communities living in poverty, which includes a team of 2000 permanent volunteers. – Over 5,885 people now have permanent housing solutions. – 306 community members have graduated from trades-fellowship programs. Top right (with sewing machine): The TAP (Taller de Aprendizaje Popular) program is a set of courses carried out in the slums and housing projects where TECHO works. Community members gain employable skills and tools by learning a new trade such as sewing, cooking, baking, catering, and hairdressing. They also work to improve technical and soft skills that are important for being part of the workforce. 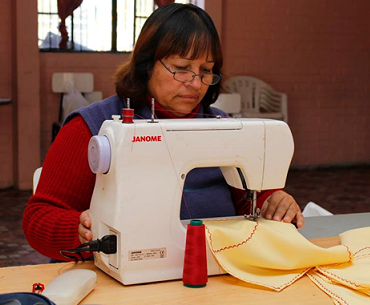 This photo is of a woman participating in the sewing and dressmaking course in Vila Pedro Lira, Santiago, Chile. 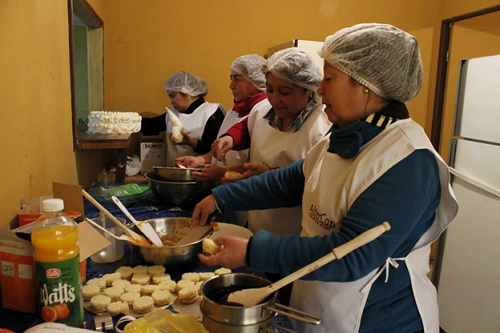 Lower photos: These photos are from the Baking and Pastry Course held in the San Miguel III community in Santiago, Región Metropolitana. The course was impemented together with Altercap (an official Technical Training Institute). The students graduated on 6 June 2014 with an official completion certificate from SENCE (Servicio Nacional de Capacitacion y Empleo de Ministerio del Trabajo y Previsión Social – Chile’s National Service of Training and Employment of the Ministry of Labour and Social Welfare).